Right now, Memphis is the perfect combination of low purchasing prices, high rental demand, and growing metropolitan areas. New startups, cultural events, restaurants and more are popping up around Memphis and peaking the interest of many millennials. Meanwhile, the “Choose 901” culture, along with various networking and community organizations are working to encourage young adults and families to stay in (or come back to) to Memphis and the surrounding area. Memphis today is a city filled with renewed hope and growing opportunities, not only for its residents, but for real estate investors as well. Give us a call if you're interested: (901) 213-6102. Those who might worry that this growth could prove to be a passing phase should note that Memphis is home to several nationally and internationally-renowned enterprises and organizations, including FedEx, the Memphis Grizzlies, AutoZone, International Paper, ServiceMaster, and St. Jude Children’s Research Hospital. All of this, combined with the city’s central location on the Mississippi River means the Memphis market isn’t going anywhere. If we zoom out and look at the Memphis real estate market as a whole, you’ll notice it’s rather healthy. Currently, it’s the nation’s third-best market for first-time home-buyers. Median prices are right around $130,000 and continue to rise. Even in 2016, the median sales price has risen significantly. While prices are terrific for first-time buyers, they are also terrific for investors. You can easily invest in a Memphis property and achieve a solid return over the course of a few years. It’s easier to invest because median prices are lower than the nation’s average and the market continues to grow. The flipside is that Memphis properties are typically hard to come by. Since housing is quality and affordable, real estate is going quick once on the market and many people aren’t selling. It’s even more important to keep an eye out for great properties because they will get snatched up quickly. Home sales and total sales revenue are both up 9% from the same period in 2015. Total home sales revenue was up 25% in 2017 versus 2016. 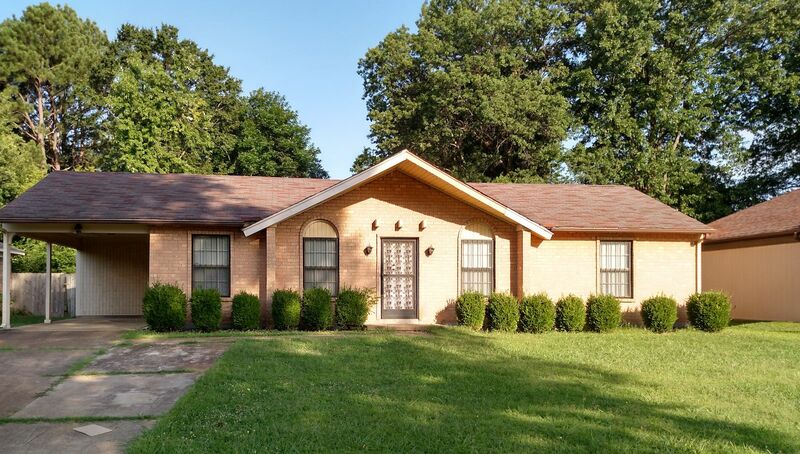 The Memphis real estate market is strong and continues to grow. It’s a great time to jump into a real estate investment while everything is growing and increasing. As you can see, the Memphis market is exploding and is forecasted to continue in strength. Since the bottom fell out in 2011, it's been a prime time for investors to secure real estate, make improvements and turn the investment into a serious source of cashflow. For those who have invested, it's been a terrific wave recently and will continue to be great with a 3.8% increase forecasted. Memphis remains one of the best markets because of the median house price, growth of the market and lower cost of living within Tennessee. Rental prices have been somewhat of a rollercoaster over time, although we're not seeing major swings in rental prices. According the graph above, we're seeing annual changes by an amount of $20 on average. However, in some Memphis neighborhoods this is going to vary much more. The Memphis metro is where the rental boom is taking place, as the average rental price is approximately $200 more than in Memphis proper. 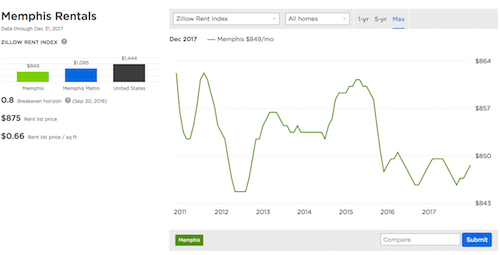 Why is the Memphis metro so much higher for rental properties? Well, you must consider the growth of the metro, particularly in Collierville and Germantown. Collierville in particular is a booming marketing because more families are settling into that part of the metro. Since it is highly desirable, the rental price continues to inch up. That isn't to say Memphis proper is a lesser area, it just means Collierville, Germantown and other outlying areas are quite popular at the moment. Above all, Memphis offers real estate investors exceptional rent to value ratios that they simply won’t find in larger, more traditional property investment markets. Cash flow comes quicker and easier with real estate investing in Memphis than it would in high interest, high-priced markets such as Los Angeles, Las Vegas, Phoenix and New York. Depending on the amount you have to invest, you can easily acquire real estate in Memphis and have it paid off in less time than you would in the locations mentioned above. Once the mortgage is paid, you can easily rent for a steady stream of cashflow or you can turn the house for a profit. The value is incredible. And once you benefit from a single property, you can expand your portfolio from there.